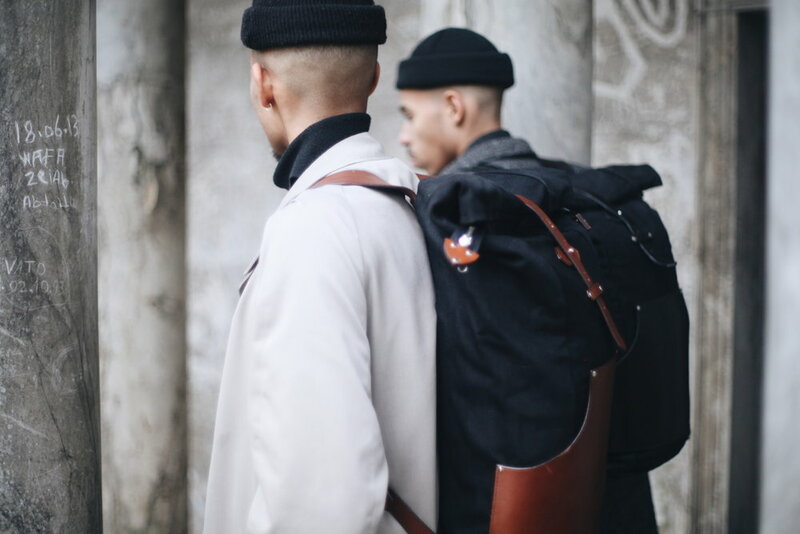 Nomadic People was founded by close friends Tobi and Julius in Peckham, South East London. Influenced by multicultural characteristics of their hometown, the brand was created with the aim of providing distinguished pieces for today’s traveller, creating a unique breed of ‘gentlemanly urban’ style and function. The styling of the logo symbolises the wide range of influences and inspirations taken from different historic cultures and tribes most noticeably the Native American Tipi representing the ‘I’ in Nomadic. This has also become the stand-alone symbol in which people instantly identify the brand. The pair have taken an organic approach into creating designs unique to their beliefs and apply their skills and crafts to produce quality goods. Mainly utilising finest handpicked Leathers and other high quality materials, Nomadic People hand-make individual pieces ranging from Heavy duty Rucksacks and Tote bags to document holders and wristbands. The brand adopts a strong belief in sourcing materials from local and British business in order to promote homegrown trade. © 2017 Copyright Nomadic People. All rights reserved.